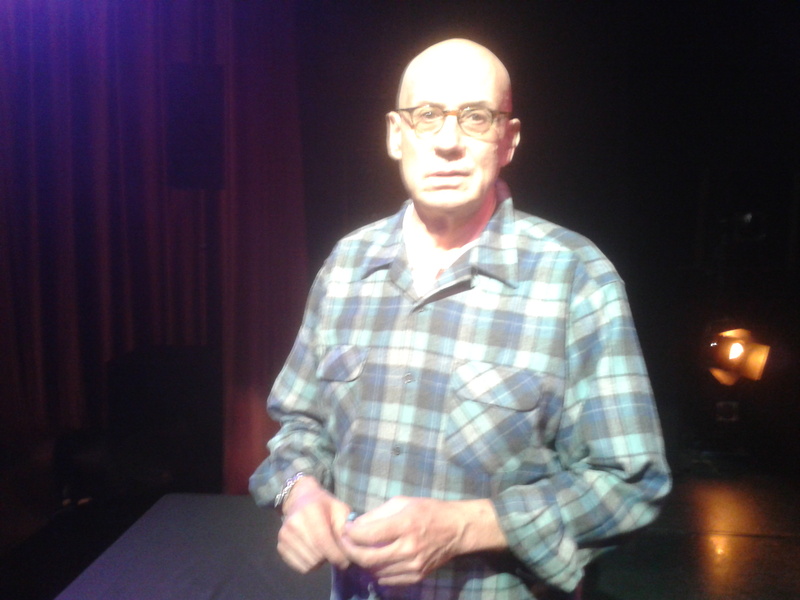 Shortly before I went to see ‘An Evening with James Ellroy’ at the Dancehouse theatre in Manchester I re-watched an interview on YouTube he gave recently with Craig McDonald in Iowa City. The interview ends with Ellroy fielding questions from the audience and, with a little prompting, they ask him ‘Why do you write?’ He responded by reciting from memory Dylan Thomas’ poem ‘In my Craft or Sullen Art’. It’s a magnificent performance, all the more touching in the centenary year of Thomas’ birth. And so last night in Manchester, I and many other Ellroy fans, the lovers ‘who pay no praise or wages’, crammed into the Dancehouse to see the great man speak. No wonder then that the Second World War setting of Perfidia is so vivid to him despite the fact the conflict ended three years prior to his birth. Ellroy described how as an eight -year- old child he thought the war was still going on and his mother had to disabuse him of the notion. I’m not an Eliot expert, but a line from the same poem came to me when he was speaking, ‘History is now and England’. I felt it in the theatre that night. Things progressed with Ellroy reading from Perfidia. He chose two passages, firstly the prologue, and then, a much more extensive and powerful quote from the diary entries of Kay Lake, originally a character in The Black Dahlia. Here at an earlier point in her life, she invites the reader into the inner sanctum of her thoughts on her country, as America prepares to enter the Second World War, and on her secret love for Bucky Bleichert. Dedicated Ellroy readers will recognise how these plotlines begin to build a new chronology of the LA Quartet. The quote begins with Kay seeing from her bedroom terrace ‘A line of armored vehicles chugged west on Sunset, to fevered scrutiny and applause’. Knowing that it portends her country going to war, the image instigates a chain reaction of memory in Kay: her upbringing in Sioux Falls, South Dakota, the brutal murder of a black man by the Ku Klux Klan, her ill-fated involvement with Jazz drummer and dope peddler Bobby DeWitt and how this led her to Lee Blanchard and the heart of the LAPD. The memories stop as the convoy passes out of her view, and the quote ends ‘Nothing before this moment exists. The war is coming. I’m going to enlist.’ Incidentally, at the Iowa City event Ellroy described how the idea for Perfidia began when he looked out of the window in his home in LA and suddenly the image came to him of Japanese-Americans being driven away for internment in Army trucks. The similarity between this vision and the opening of Kay’s diary makes me think this is one of his favourite passages in the novel. Perfidia has split the critics. Were there any readers in the audience I wondered who would voice dissent? Not as such, but when Ellroy stated that he expected his readers to obsess over his work due to the sacrifices he’s made one plucky woman asked him what exactly had been the sacrifices. Ellroy explained that he’s sixty six years old, divorced, with no family and very little social life. If you think that would make him sound miserable, you’d be wrong. I’ve never seen a man brimming with so much energy. He seemed delighted to be in the UK and extolled a very anglosphere view of the world: one of the main themes of the new Quartet, he explained, was the defence of the West which he described as, Britain and America, the defence of civilisation as we know it. Ellroy also tied the UK and America to his love of the American idiom: ‘Hipster patois, Yiddish, Klan hate spiel’, he said it originated from writing in English, ‘the language of Shakespeare’. Transcendentally alive and safe and warm. It’s yours, it’s his, it’s ours, it’s hers. The alternative is certain death. Ellroy would have written this poem knowing he had no guarantee that the novel it appeared in would ever be published. At the time he was a recovering alcoholic and drug addict working as a golf caddy with dreams of becoming a great writer, but no experience of ever being published. That was over thirty years ago. It’s been a long road from caddying to Perfidia, but if any writers life-story could inspire you to search the muse it would be Ellroy’s. His barnstorming performance in Manchester was yet more proof of that. It may be over-reading on my part (but hey, I’m a dreamer so humour me), but I wonder if this was a reference to his 1984 interview with Duane Tucker for Armchair Detective. The interview is the first to appear in Conversations with James Ellroy and, as I state in the book, there is reason to believe that the interview was never actually conducted by Tucker but written by Ellroy himself, possibly as an attempt to boost his profile as a young writer. One of the clues that Ellroy may have written the interview is the repeated spelling of icon as ikon in the text. The ikon spelling is common in Ellroy’s novels but seems unusual in the interview given that it should have been transcribed by Tucker. As I say, possibly over-reading, but the words ‘your work is iconic, KKK, iconic, KKK’ were reverberating in my mind as I took the train home that evening. It sounds (or reads) like you had a great time. I’m glad he remembered who you are. Iconic, KKK indeed! Wish you could have been there. Next time. I’ve just thought – and this doesn’t happen often so bear with me – maybe he meant for you to copy one of his Ellroyisms and write “ikonic” hence the “KKK”. Or maybe not. I’ll stop before this turns into Pseuds Corner…. I’m not sure if I’m onto something with the ikon Duane Tucker interview or if it all just coincidence. There’s certainly a lot of circumstantial evidence which I mention in the book and the post on Tucker.